Alexandria, VA – ASTA announces that travel agency members reported that, for most agencies, 2012 performance was better than 2011. In response to a recent survey, ASTA found that that almost half of member agencies saw stronger revenue and transaction volume in 2012 as well as an increase in the number of clients. 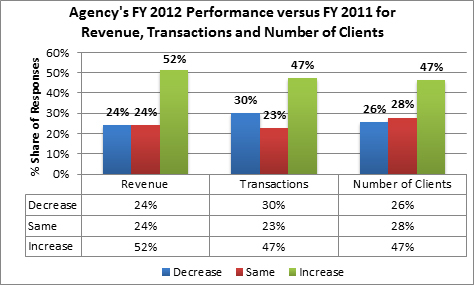 Retail Leisure agencies reported the strongest performance gains in 2012. 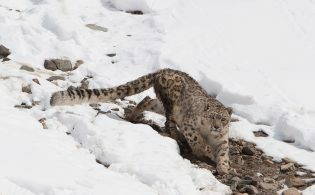 Fifty-four percent reported increased revenues as compared to 2011. 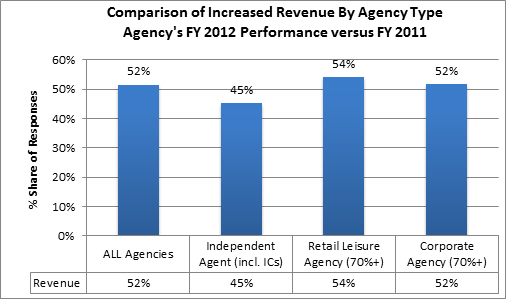 Independent Agents reported the lowest increased revenue (still strong at forty-five percent). When asked about sales per travel segment, agencies reported the biggest increases in sales of air, hotel and insurance as compared to 2011. Segment sales were either flat or increased for the majority of reporting agencies. Overall, a majority of ASTA agencies “realized a profit” in 2012. When agencies were broken out by business type, the highest percentage of profitable agencies was reported in the corporate agency segment. Survey data was collected through the 2013 ASTA Research Family. The ASTA Research Family is a panel comprised of a representative sample of ASTA member travel agency owners and managers and reflects ASTA members in key agency demographics including sales volume, leisure/business mix, number of part-time and full-time employees and geographic location. The survey data was collected online via www.surveygizmo.com in January 2013. The reply level indicates a minimum of 95-percent confidence with an error rate +/- 5 percent. For more detailed results, download the summary report from ASTA’s Research Page. Or, contact Melissa Teates, ASTA’s director of research, at [email protected].